The Times-7 Slim Line A6590C Ultra Low Profile UHF Antenna with 2m SMA to RP-TNC connector is ideal for warehousing operations. This antenna has an environmental rating of IP65 along with fire retardant Kydex material. Along with its versatile and slim design, the A6590C provides high performance in industrial RFID applications. The Times-7 SlimLine A6590C is a circular polarized UHF RFID ground Antenna the offers 9 dBic gain, measures in at 36 x 12 x 0.5 inch and includes an integrated 6 foot Pigtail cable with RP-TNC Male connector. 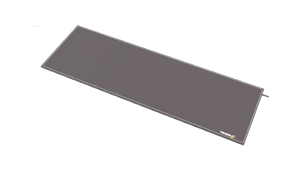 Part of Times-7’s exclusively unique range of ground antennas the SlimLine A6590C is optimized for RFID deployments involving moving products, assets and people. From conference attendee & people tracking, retail presence aware / loyalty marketing & race timing, the Times-7 SlimLine A6590C is ideal for applications where traditional side antennas are unsuitable or not optimized for the application. At just 8 mm / 0.3 in. thick, the durable, high performance A6590C is uniquely capable of lying flat on the ground within a doorway sized footprint, and can withstand payloads of over 200 kg (440 lbs. ).